Miami has the 6th largest Black population of any metropolitan area in the nation at 1,229,061 which is 21% of the total. 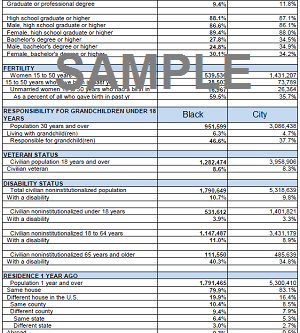 Many are not aware that Miami’s Black population is so large. Almost 20% of this population is foreign born. The Miami metro is home to approximately 271 thousand Haitians, 150 thousand Jamaicans, and many Black Hispanics of African decent from Puerto Rico and the Dominican Republic. After PayPal purchase your browser will bring you directly to the download page.